PaveGel™ is a synthetic rubber copolymer latex additive designed to enhance the fuel resistance, toughness, and sand suspension properties of coal tar pitch emulsion (CTPE). PaveGel™ meets FAA P625, FAA P627, FAA P631, and ASTM D4866 specifications for latex additives. • Meets FAA P625, P627, P630, and P631 specifications. • Enhances resistance to oils, fuels, and grease. • Provides a blacker dried sealer film. • Provides sand suspension and uniform application of sand slurry mixes. With mixing tank agitator turning, add proper amount of water to pavement sealer concentrate. 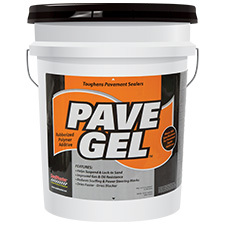 Following the addition of water, add 2% PaveGel™ based upon pavement sealer concentrate (2 gallons of PaveGel™ per 100 gallons of pavement sealer concentrate). Dilute PaveGel™ 1:1 with water before adding to sealer mix to reduce polymer shock and promote uniform dispersion. When mix begins to thicken, add sand slowly. Agitate thoroughly before and slowly during sealer application. Higher levels of PaveGel™ may be added to comply with FAA P625, and P627 specifications. For optimum performance and durability apply 2 coats of properly mixed SealMaster® pavement sealer fortified with PaveGel™ and sand. A third coat may be applied to high traffic areas such as entrances, exits, and drive lanes. Apply mixed pavement sealer fortified with PaveGel™ at a rate of .11 to .13 gallon per square yard (70-82 square feet per gallon) per coat. NOTE: Application rates may vary somewhat due to pavement age and porosity. Both surface and ambient temperature shall be a minimum of 50°F and rising before and during application. Temperatures shall not drop below 50°F in a 24 hour period following application. New asphalt surfaces should be allowed to cure a minimum of four weeks under ideal weather conditions (70°F) before applying SealMaster® PaveGel™. KEEP OUT OF REACH OF CHILDREN. Do not store unopened drums or pails in freezing temperatures.